Our mill situated at Khanna, Ludhiana district of Punjab (India) is spread in a 6.5 acres of land. The 12 rolling bodies of the machinery are installed in a 5-story building with 2 sides open. One side with all the 5 storeys is used for cleaning of wheat & thus called as cleaning section while the other side of all the storeys is used for grinding purposes having per day capacity of 120mt, is termed as grinding section. Along with this, the premises also have 3 godowns to store wheat & its produce. Involves conveying piped air, being under suction using a centrifugal type fan, incidentally the heart of a Pneumatic system, a separator in the from of a cyclone, and a dust collector usually of the filter sleeve type, and a dust collection system usually consisting of either a Reverse jet filter collector cleaned by high pressure fan through a rotating manifold, or a similar filter cleaned by jets of compressed air controlled by an electrical timing mechanism. Wheat falls freely though the inlet onto the coarse screen which removes string, straw, large stones, maize etc. 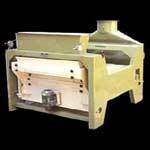 the through falls onto the sand screen which removes broken kernels, sand & other fine impurities. Tailings from the lower sieve layer consist of cleaned grain and pass to the outlet. The drive mechanism imparts a circular motion on the sieves, which gives an increase in capacity and also more efficient sieving effects. It effects three definite & distinct separations. Removal of material of larger diameter than the grain being handled & much of the material that is substantially longer, straws, maze, etc. Removal of light screenings by means of an efficient aspirating system combined with a setting chamber for the separation of the majority of light screening from the air, chaff, husks, light grains, etc. In certain circumstances due to types of wheat available, or products specifications, specific gravity separators are used to make efficient separating not possible by other means. Such separation would be.